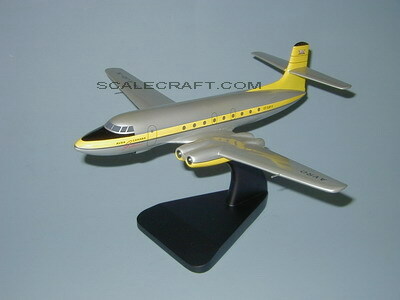 The Avro C102 Jetliner was a Canadian prototype medium-range jet airliner built by Avro Canada in 1949. It was beaten into the air by only 13 days by the de Havilland Comet, thereby becoming the second jetliner in the world, yet the name "Jetliner" was more catchy and for many years all such aircraft were colloquially given that name. The aircraft was considered suitable for busy routes along the US eastern seaboard and garnered intense interest, notably from Howard Hughes who even offered to start production under license. However continued delays in Avro's all-weather interceptor project, the Avro CF-100, led to an order to stop working on the project in 1951, with the prototype Jetliner later cut up for scrap.